Participate in NACOR and join a community of professionals dedicated to achieving high standards, and send a message that you are committed to providing quality care and improved patient outcomes. Regularly review your performance, identify your gaps and compare yourselves to others. Understand your performance by reviewing individual outlier reports and trends over time. 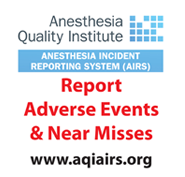 Access links and tools from AQI, other professional societies and national experts in quality improvement to help you and your team learn and improve. NACOR can help you submit data for the Quality Payment Program (QPP) under the Centers for Medicare & Medicaid Services. Reports from NACOR can be used to meet Joint Commission requirements for groups and facilities and Maintenance of Certification requirements for individuals.